No Bradley Wright-Phillips. No Alejandro Romero Gamarra. No Daniel Royer or Aaron Long, at least from the kickoff. No Kemar Lawrence. No problem! 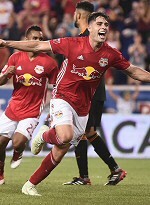 Mired in a difficult stretch and tasked with hard lineup decision, Chris Armas elected to rest a number of key players, and yet saw his team emerge victorious, 1:0 over Houston. Brian White, who made his first MLS start, scored his first MLS goal. Other than White, starters included Fidel Escobar, who hadn't played since March, Andreas Ivan, also making his first start, and Cristian Casseres, who was making his MLS debut. The lone goal came in the 55th minute. After Michael Murillo swung a cross into the box, a Houston defender attempted to clear it out of bounds. Alex Muyl made a fantastic play to keep the ball from going out, centering it to White. The rookie easily tapped in from close range. That was all Metro needed. Playing on a hot, muggy night that was reminiscent of the visitors' home, the makeshift defense looked anything but. Once you consider that the starting central midfield pairing, Casseres and Tyler Adams, totaled 37 years old, it makes the shutout that more impressive. Metro, who kept games in hand on Atlanta for the bulk of the season, now finds its southern competitors with a match in hand. And yet, Metro is the one on top of the league... be it with squad rotation. Lineup: Robles, Lade, Escobar, Parker, Murillo, Adams, Casseres, Davis, Ivan, Muyl, White. Subs: Royer, Rzatkowski, Long.